Russian President Dmitry Medvedev and US President Barack Obama have hailed an improvement in relations between Washington and Moscow. Speaking after White House talks, Mr Obama said the pair had "succeeded at resetting our relationship". He said he wanted to "broaden" the links between the US and Russia. 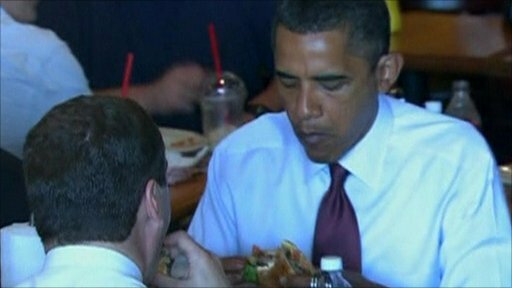 Earlier, the two leaders ate hamburgers and shared fries at Ray's Hell-Burger as amused bystanders looked on at the restaurant near Washington.